Because of our special relationship with Eastwood we can get this as fast, or faster than anyone in the industry. In some cases, we even have preferred build slots we can offer you. 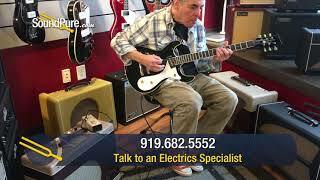 In this video, Sound Pure Electric Guitar specialist Eddie Berman tests out the Eastwood Sidejack Baritone STD Black Electric #1603038. The sidejack series was one of the first models introduced by Eastwood in their first year of business. Owner Mike Robinson's passion for 1960's Mosrite guitars was the catalyst for the Sidejack series. It started with one model, the Sidejack DLX, and has now grown to dozens of models including 12-strings, baritones, basses and the new Sidejack Pro DLX. Sidejack guitars are new classics that faithfully serve the Surfers, the Punks, the Indie Rockers and even the Country Pickers. Michael Robinson, the founder of Eastwood, started out buying and selling rare electric guitars. The difficulty and cost in obtaining these instruments, along with what he calls the all-too-often "sketchy quality that played like crap" led him to start a company building his own revivals from the edges of rock history. Eastwood has reinvented models and even worked with existing luthiers such as Jeff Senn to bring iconic and unique instruments to a wider player base. The result is a wide variety of instruments with a visual and sonic aesthetic all their own, coupled with an improved and smooth playability derived from modern build techniques. Each instrument is factory-milled and then hand-assembled and inspected by a seasoned pro in Chicago or Liverpool. Eastwood-playing artists include Warren Ellis, Jack White, Bill Nelson, Nick Valensi, and more! Since 2014, Eastwood also has a custom shop where they crowd-source new models for future production.